This is where it all starts. Everything you do as a sound engineer is dependent on the quality of your preamps, which determines the direction your mix will take, and ultimately how good it is going to sound. MG Series mixing consoles feature Yamaha's studio-grade discrete class-A D-PRE preamps, which utilize an inverted Darlington circuit comprising two cascading transistors in a configuration that provides more power with lower impedance. Delivering fat, natural sounding bass and smooth, soaring highs, with very low distortion, D-PRE preamps possess an impressively wide frequency range that allow them to handle signal from any audio source without over amplifying any specific elements of the sound. Having such a pure sonic platform to build on will ultimately save you time and effort by eliminating the need for excessive EQing or additional effects processing in order to "fix" your mix. The head amp determines sound quality, and op-amp integrated circuits are one of the most important parts in the head amp circuit. MG Series mixers feature high-quality custom made MG01 op-amps that we developed in cooperation with the semiconductor manufacturer. Although many other Op-amps prioritize electrical design and efficiency, we worked directly with the semiconductor manufacturer to focus on sound quality first. MG01 op-amps feature redesigned circuitry in which even the internal components and wiring have been optimized, and use materials such as high-quality silicon wafers and copper wire to achieve superb resolution. With phantom power, MG Series consoles allow you to take full advantage of the greater frequency response and high sound quality of condenser microphones. The input channel with PAD switch accepts MIC to line level of inputs, PAD Switch attenuates high input signals that often accompany mic'ed instruments during performance, avoiding the clipping that can seriously affect your mix. 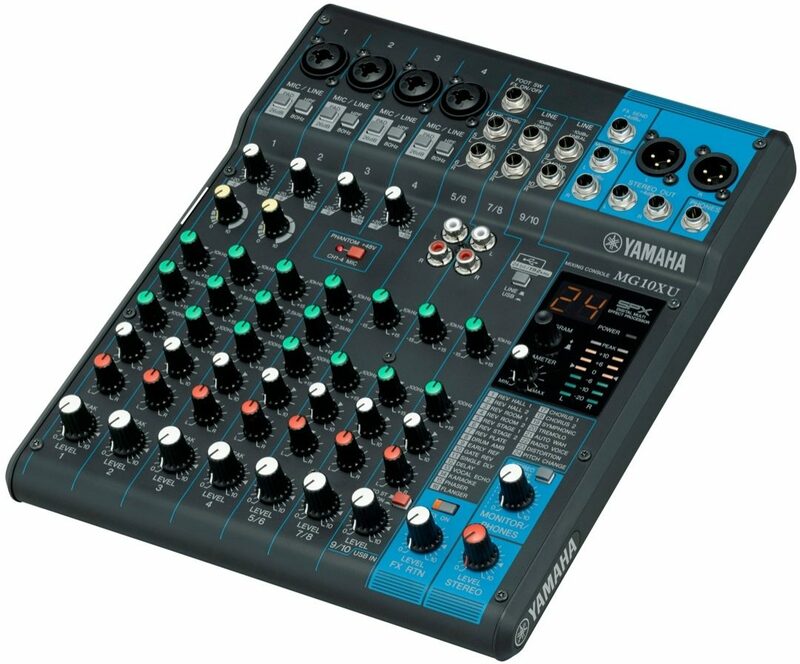 Overall: Picked up this USB-enabled Yamaha mixer as a backup for my mobile DJ system mostly for the built-in effects, but it is a very versatile unit. Easy to use, very clean-sounding and durable -- everything you want in a piece of equipment that gets lugged around from gig to gig. This is now my go-to main mixer. Overall: I tried out a Behringer xenyx, but it was junk right out of the box. 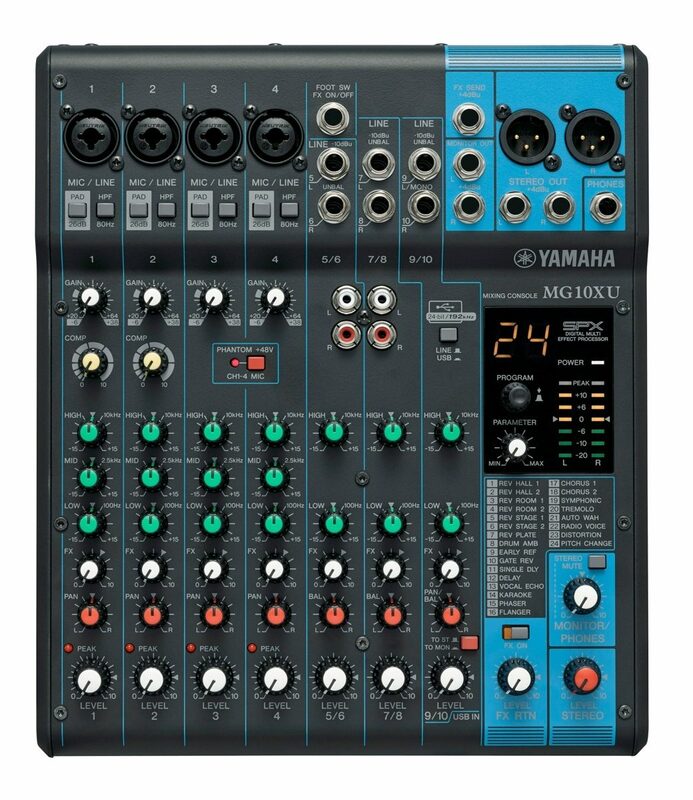 That was the third time I've had problems with their mixers, so I opted for the Yamaha, and I was not disappointed. This mixer came with clear and concise directions and took off right out of the gate. I will say, the effects are not the best I've ever heard, but they are adequate and frankly, I bought this mixer to be a mixer, not an effects processor. I already have plenty of those. The effects that are on the mixer work really nice for vocals and podcasting, though, and two of the mic inputs have single dial compression knobs, which make it even better for vocals. Style of Music: Yes, thank you.